What are the baggage restrictions and limits of all the airlines I will be traveling with? Some countries have more restrictive guidelines that are more stringently enforced. Smaller airlines in Europe, for example, require smaller and lighter bags than in the US. Make sure you know what the requirements will be so you don’t get stuck having to pay hefty fines or finding new luggage at the last minute. I am always happy to answer your questions regarding airline baggage restrictions and will advise you on the requirements of all the airlines you will be flying with. How much attention do I want my luggage to get? Yes, sometimes it’s tempting to get the stand-out, fashion-forward luggage set in fuchsia — but if you’re heading to a destination that’s known for theft, sometimes the better option is to pick a suitcase that blends in with the crowd. There are always things you can do to help with identification — a colorful ribbon, a sticker, a unique tag — but if you don’t want your luggage to be a target for opportunistic thieves, just opt to keep it simple. How much transferring will I be doing on this trip? Are you heading to one main location that will be your “home base” of travel operations? Or will you be constantly on the move from city to city, hopping trains, getting taxis, taking buses? 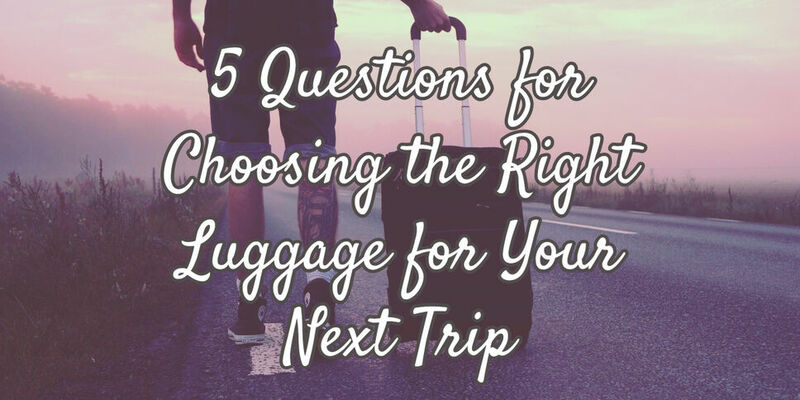 Will someone be available to help you lift your bags if you need assistance (partner, children, tour assistant), or will you be the one fully responsible for handling your luggage at all times? The more you’ll be moving and hefting, the more you should aim for simple, lightweight, durable, and versatile. Pack only the essentials, and look for bags that offer more than one transport method — for example, a carry-on with hidden pull-out straps and can be transformed into a comfy backpack for hands-free movement.